The first thing I need to say about LoCash Cowboys self-titled, debut album is ‘it’s about time’. The duo, made up of Preston Brust and Chris Lucas, have been around for a while, putting two singles, “Here Comes Summer” and “Keep in Mind,” in the Top 40 back in 2010. They released more singles in 2011, 2012 and 2013, but none of them got as much air time as I think they should have. As a result, not many people heard the songs or requested the songs to be played on the radio, and none of these songs did very well on national music charts. This singer/songwriter team has had a Number 1 single, but it wasn’t something they recorded. Keith Urban took “You Gonna Fly,” written by Preston and Chris, to the top of the charts, in 2012. Tim McGraw had a Top 10 hit, “Truck Yeah,” also written by this duo. Several songs LoCash Cowboys previously released as singles are also part of this new album, including my favorite, “Keep in Mind.” I will never understand why this song peaked at No. 34 on Billboard’s country chart. Well written, and certainly well performed, the song should have been a Number 1 hit for the duo. It seems not enough radio stations picked the song up at the time of its release. This debut album comes just six months after the signing with their new label, Average Joes Entertainment. Fans will find a little of everything in the music on this new CD. A lot of the songs are about family and fun, some are flirty songs, and of course there are some of the high-energy songs you will hear at their stage shows. I wasn’t a fan when I first heard LoCash Cowboys. Their music was loud, and seemed to be more for the young country/rock fan than it was for the older, more traditional country music listener. However, they won me over with “Keep in Mind,” and they are certainly keeping my attention with songs like “Chase a Little Love,” and “I Hope.” Whatever you may be in the mood to listen to, they seem to have a song that will work for you. I’ve seen them in concert several times, and if they are ever back in this area I will definitely see them again. It didn’t take long for me. I went from ‘I don’t like them,” to “They’re ok,” to “I’m one of their biggest fans” in no time at all! Preston tells his fans that what country music really boils down to is the power of the song. His hope is that the group will be able to reach out to both the older and younger crowd. One of the hopes for the duo was that this album contain songs that best define LoCash. I think they accomplished that. 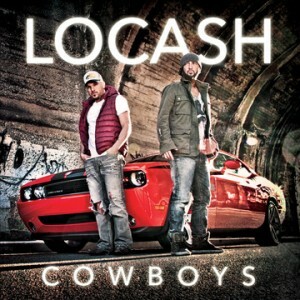 You can get all your LoCash Cowboy news by visiting their website at www.locashcowboys.com, and follow them on Twitter @locashcowboys. Keep up with everything country music by visiting our website at www.countryschatter.com, and follow us on Twitter @countryschatter. Music Charts Magazine Album and Artist Reviews © Permission must be asked to reproduce this article.